During the 2012 election, Rebecca Sinderbrand (who was with CNN at the time, but is now the Washington Post’s political editor) sent out only a handful of tweets each day. This year, Sinderbrand’s publication has an entire social media team, sending out about five tweets per hour, not including a separate account dedicated solely to politics. “It doesn’t change the story that you’re telling, just the channel.” - Paul Singer. Click the image to read the whole series. 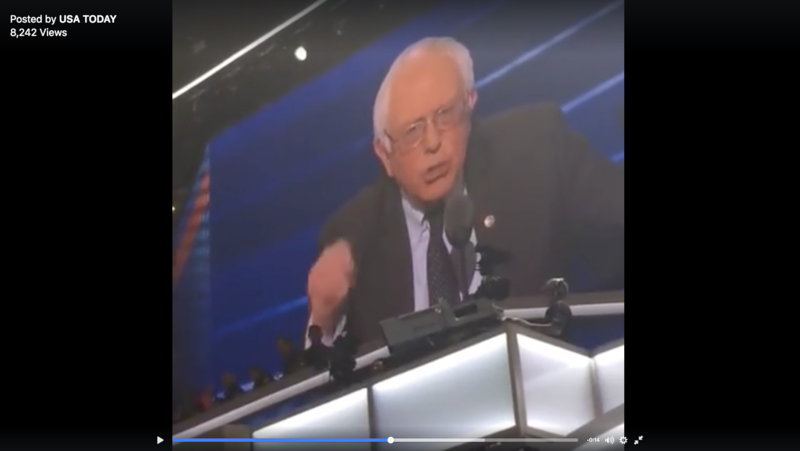 At the Republican National Convention, the Post’s social media team used Twitter, as well as Snapchat, Facebook and Facebook Live. This cycle is all about storytelling on multiple platforms and connecting those platforms. Take, for instance, a Facebook Live video Sinderbrand did with Robert Costa, the national political reporter with the Washington Post. The video appeared on Facebook, but was also tweeted along with tags to their respective Facebook pages. They are planning to cover the DNC in much the same way, but will adjust as necessary, she said. Sinderbrand also said the annotation platform Genius will be huge for them during the conventions. They’re going “all in” on crowdsourced comments, Sinderbrand said. Genius essentially breaks down a text with annotations that can be easily added and edited, creating engagement with readers in an up-to-date setting. 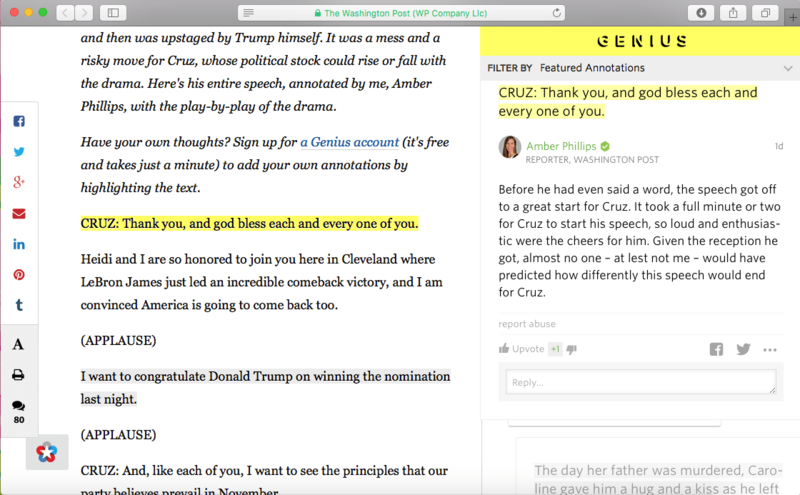 A screenshot of Genius used by The Washington Post to annotate Ted Cruz’s speech. “All coverage will be happening in real time,” said Sinderbrand. “Every convention comes with a new hot technology,” says Paul Singer, the Washington correspondent at USA Today. In 2012, Tout seemed to be the next big thing, allowing people to post video directly to Twitter, similar to Periscope. He joked that USA Today and World Wrestling Entertainment were the only two companies using this experimental technology, so election videos would appear alongside wrestling, making for quite the interesting landing page. During the 2014 campaign season, Singer said they experimented with “Yo” to broadcast short, striking remarks during the debates. This year, the two popular platforms are Snapchat and Facebook Live. “It doesn’t change the story that you’re telling, just the channel,” Singer said. Singer said the biggest difference for USA Today this convention season is that they are spreading themselves out more. In the past, multiple reporters would be sent to cover the same thing, but this year, they plan to better disperse reporters to cover more ground effectively. “We’re attempting to deploy a pretty unified staff at this convention instead of two separate units,” said Singer. Sinderbrand started her career with the Washington Bureau of the Associated Press during the 2000 presidential primary season and general election. At that point, she said, the web was still young, the stories written didn’t necessarily appear online, and not everyone had cell phones. In 2004, she recalled, a man traveling with the campaigns would “bring the WiFi.” Everyone would huddle around him trying to connect to the internet, she said. Sinderbrand said 2008 was the first campaign that resembled the current one, but it wasn’t until the 2012 election that social media became a much bigger element. Telling stories on social media has become its own focus, she said, and now it’s important to look at platforms specifically to see what story is best suited for each platform. The challenge — and the benefit — of social media is that it’s a flexible medium, but not every platform works for every story. While Singer said Facebook Live can be a great platform to share news, it works best if you plan ahead. 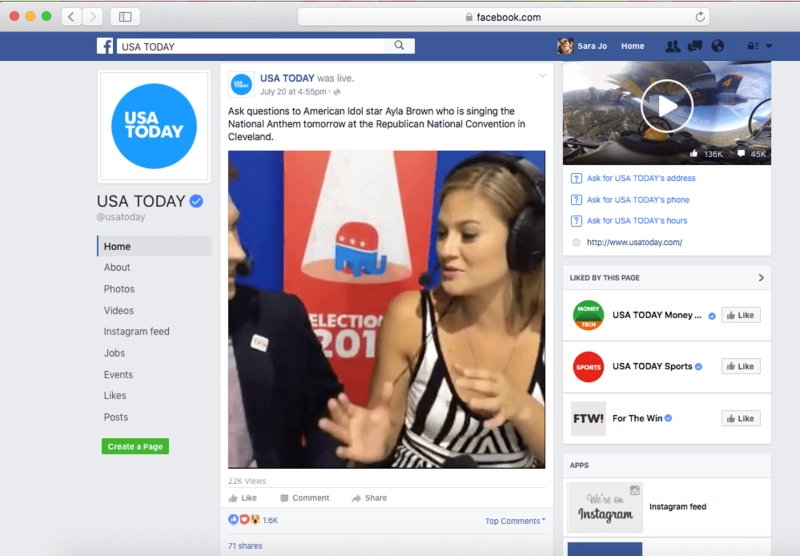 Amanda Bennett, director of Voice of America, said Facebook Live has become one of the quickest ways to get information out there. Bennett said events such as speeches and protests will be displayed using this method, but that it will also be used for Q&A sessions with reporters to increase engagement. On Twitter, Voice of America shared articles and news, but also retweeted what their reporters were viewing in real-time. These ranged from videos of a tuba player interrupting anti-gay protesters to pictures of a “human wall” around the Quicken Loans Arena. Bennett said this is because they want to encourage people to go to social media to get the different personalities and views out there. “There’s not an overall strategy to this as much as a strategy that takes into account the different audiences,” said Bennett. Correction: The first sentence of this piece has been updated to clarify that Sinderbrand was working with CNN during the 2012 election. Sara Jo Lee is a Pennsylvania-based writer. She is a recent graduate of the University of Delaware where she majored in English and journalism. You can follow her on Twitter @saraaajolee.